I turned up at Mike Jbara’s Master Class presentation Friday afternoon, “Achieving Authentic Studio Quality Sound,” expecting fireworks. Jbara is the chief executive of MQA and many internet denizens had declared that they would be attending his presentation to oppose what he would be saying. But all was quiet during Jbara’s 45-minute talk on what he regards as the benefits of the controversial codec to both the music industry and to audiophiles. 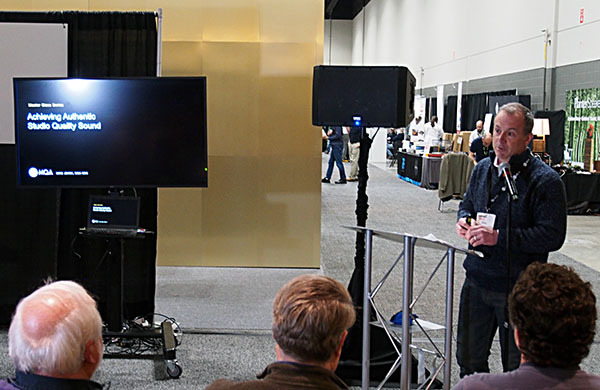 Another MQA-related Master Class takes place at AXPONA Saturday April 13 at 12 noon. Moderated by Besflores Nievara Jr., Brand Ambassador for Music Direct, Mike Jbara will join MQA partner NAD’s CTO, Greg Stidsen, and other panelists to discuss “The Future of High Resolution Audio.” Perhaps the fireworks will be in evidence tomorrow!